I've never been a huge Monsoon fan. For no other reason than they're just a little bit too grown-up for me. But then I wrote about their sequin deer jumper last week and I found myself having a little nose around the rest of the website. Monsoon have really upped their game. This bunny dress is absolutely gorgeous. Not only is it an adorable print, it's got the whole summer/winter thing covered. The weather is so confusing right now. Too hot, too cold, can't wear tights, getting rained on in maxi dresses. It's enough to make a girl wish summer away. The details are what really make this dress, and that's something that Monsoon have always been good at. I like the pleated front, and I'm going nuts over the interesting sleeve length and exposed zip. It's just the right side of quirky. And it's only just the wrong side of £50. I think I can make my peace with that, this dress is too pretty to pass up. 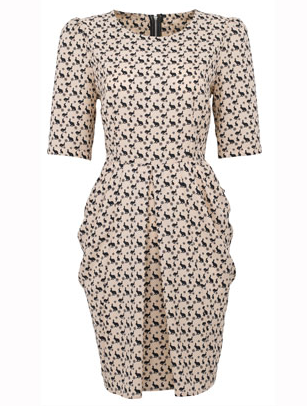 I bought this dress a few weeks back and wore it to the High Tea Cast 1st Birthday. It is divine! 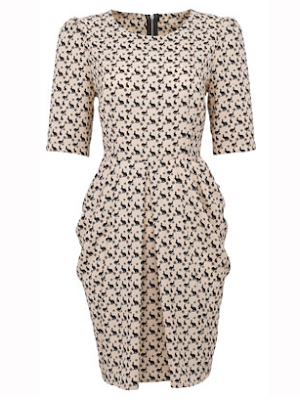 So cute, so flattering and that print is just brilliant! Only thing is that I wish it has pockets in the tulip design of the skirt! Either way, it's worth the money! !